Recently, I was trying to explain to my four-year-old son how to tell the time, and believe me it's not easy; I gave up in the end. But it was during my attempts that I was reminded of this gem of piece from Dave Allen - 'Teaching kids to tell the time'. The late, great Irish comic has always been favourite of mine and as I watched this classic routine, taken from his 1993 ITV series, I was remind of exactly why he was probably the world's greatest 'sit-down comedian'. "People say I'm that Irish comedian with half a finger but I'm not, I'm that Irish comedian with nine and a half fingers." Allen's act would see him sitting on a bar stool, facing his audience, smoking and taking the odd sip of what we all assumed was whiskey; it was, in fact, ginger ale with ice. His performance was a typically relaxed, rueful and intimate, his style was more observation than gag driven and his language was often littered with expletives. At the height of his career Dave Allen was one of Britain's most controversial comedians, his humour always poked fun at political and religious authority. He was very sceptical about religion and called himself a "Practising atheist" and he'd often joke "I'm an Atheist, thank God". 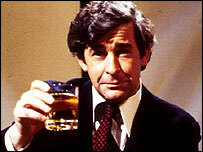 Dave Allen was was a comic genius, the like of which we will never see again. Sit back, relax and get ready to laugh, and until the next time... "Goodnight, Thank you, and may your God go with you". Doctor Who - Series 7: The Daleks are Back! Matt Smith will return to our screens tomorrow night (1st September) in the new series of Doctor Who. In the opening episode, of this the seventh series, we see the Doctor once again pitting his wits against one of his oldest and most deadly foe's - Yes, the Daleks are back! 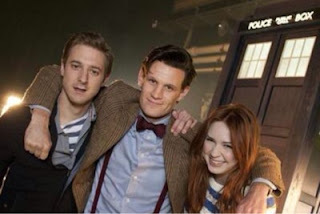 The Doctor, Amy and Rory are kidnapped and forced to go on what appears to be an impossible mission. They must enter the Asylum - a planetary prison that houses some of the most insanely terrifying aliens around. With the Daleks closing in, and the Ponds relation falling apart, it's up to the universes oldest Time Lord to save their lives and his friends marriage. This episode, entitled "The Asylum of the Daleks", is set to be an explosive start to the series which will also see the final days of Amy and Rory - The Ponds. Karen Gillian and Arthur Darvill returning for what will sadly be their final roller-coaster of an adventure with the Doctor. 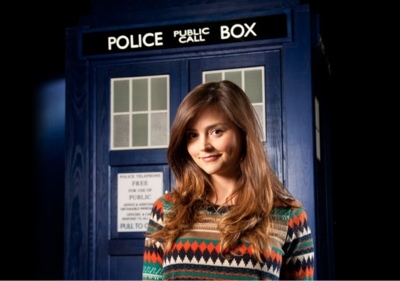 The series also introduces new companion, Clara Oswin played by Jenna-Louise Coleman, who makes her first appearance in the Christmas Special called - "The Snowman" which also features special guest Richard E Grant. So, there's a lot to look forward to over the coming weeks with six episodes and the Christmas Specials being screened over the final quarter of 2012 and a further eight during the early part of 2013 - the year that just happens to mark the shows 50th anniversary. 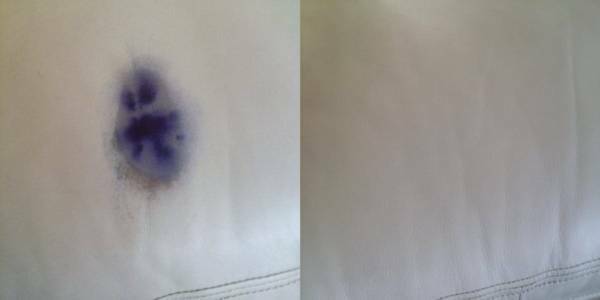 We all know that ink stains on clothing are a real nightmare to get out. Sometime ago our four-year-old somehow got hold of green bingo marker and decided to change the colour of our carpet. It was everywhere! We thought the carpet was ruined, until we came across this brilliant and inexpensive way of removing ink stains including fresh ink (like from a fountain pen), ball pen and even felt-tips - it works. So, whether the pen in your shirt pocket has leaked or one of your little monsters has decorate your fabric covered furniture with their inky art work - this is the solution. It will take a bit of time and patients but it is doable. The secret is... hairspray! Yes, hairspray, normal, everyday hairspray - the cheaper the better, in fact. The Alcohol in the hairspray will, on contact, start to dissolve the ink stains thus making it easier to remove. This tip will work well fresh fountain-pen-type ink, biro, felt pen and permanent marker, and can be used to get rid of those unsightly stains on clothing fabric and even carpets. 1. Place Paper Towels or kitchen paper directly under the spot where the garment is affected. 2. Spray affected area liberally until it is saturated with hairspray. 3. Blot the area - do not rub, always blot - with a clean cloth or, better still, Paper Towels. 4. Repeat the process of spraying and blotting until ink stain has been completed lifted. 5. Wash item - if this is possible. 6. Wear item of clothing that you thought you'd never wear again. Let me know if this magical little tip for removing ink stains has worked for you. It certainly has for us on many occasions with out any problems. But if for some reason the stains haven't come out you could always get a pair of scissors and cut them out... I'm only joking, folks! 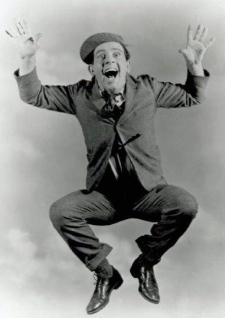 'Don't laugh at me, 'cos I'm a fool' - famous lines from Norman Wisdom's self penned number one hit song. But he never wanted anyone to take those words literally. Norman was a funny man who never stopped trying to make people laugh. He was a little genius who was continually falling over, laughing, crying and fooling around - even in the most serious of moments. Take for example the occasion on which Norman received his knighthood from the Queen, even then he couldn't resist messing about, he performed his trade-mark trip and the Queen laughed. I've always loved Norman, his humour, films and music and I was lucky enough to see him live on stage some years ago at the Wolverhampton Grand. It was a superb night of entertainment that saw Norman in sparkling form, throwing himself around as though he was still a young man - he was actually seventy-five - singing his most famous songs and playing a whole array of musical instruments. The audience loved him and at the end he received a well earned standing ovation. After the show I was lucky enough to meet the great man and I got a signed photo, too. Comedian, Singer-Songwriter and actor Norman was born in the Marylebone district of London, and he will be best remembered for the series of films produced between 1953 and 1966, featuring his much loved on-screen "gump" character Norman Pitkin. Films such as Trouble in Store, A Stitch in Time, The Square Peg, The Bulldog Breed, Up in the World and The Early Bird had us roaring with laughter. And, of course, no one will ever forget his catch phrase "Mr Grimsdale". But most of us will probably have forgotten, or at least not seen for many year, the Heineken Deck Chair Advert that was made in 1987 and featured our hero. In this clip we see Norman trying haplessly to set up and sit in his deck chair... he fails miserably until he downs a pint of Heineken - the beer that refreshes the parts other beers can not reach. They certainly don't make adverts as good as this anymore, or as long - 1 min -37 secs - so, I thought it would be nice to have a walk down memory lane and share this little bit of Wisdom with you all. I'm sure there were more of these Deck chair adverts featuring Norman Wisdom but so far this is the only one I've come across. 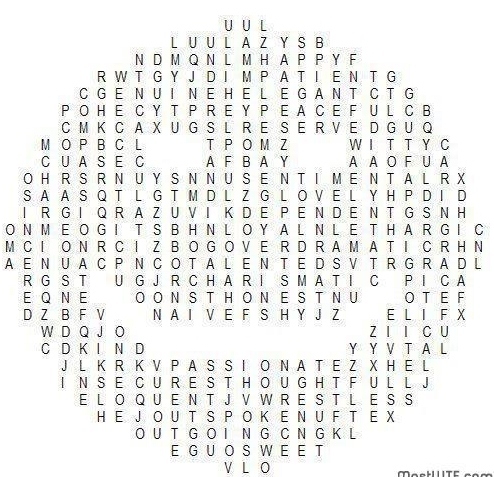 Let me know if you've seen any of the others by posting a comment. More of Andy's Blog Posts you may enjoy. I don't think David Blaine, Dynamo or David Copperfield could do this! It's the best disappearing act I've ever seen! Where does that case of beer go? The more you watch this clip, the more you realise how easy our female thief makes this crime look. Even though what she's doing is wrong you can't help admire how cleanly she executes the move. She doesn't miss a beat as she places the chosen goods under her skirt and then simply continues with her shopping as though nothing has happened. She's obviously done this before but this time she, and her family - they must know what's happening, they've got to be in on it - has been caught on camera and I assume she got the appropriate punishment. After being in any business for twenty years you're bound to be left with some special moments and in this blog post I'm going to be concentrating on a very special time in my life. 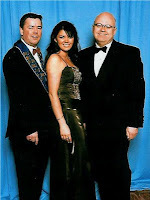 Ten years ago - 2002 - I received the great honour of being made the president of the British Magical Society - one of the oldest and most prestigious in the world, and it really was a year I will never forget. I became one of the youngest ever presidents in the society's history and this alone created a lot of publicity for me and the club. Newspaper and radio interviews seemed to be a regular occurrence in those first few weeks and I was even featured on BBC Midlands Today. It was a busy year all round because as president you have to organise a whole years worth of events, and as the society meets weekly, that's a lot of organising. On top of this were the many invites from other clubs for me, as president, to attend and represent the BMS at their dinners and events... busy, busy busy! I don't how I fitted my own job in. For me one of the most important things was put together as good-a-line-up of lectures and events as possible and I was very lucky in somehow managing to engage some of the biggest names in magic to take part and lecture for me during my year as president. Steve Dacri was on tour, over from America, and I was lucky enough to secure his services for the opening night of my presidential year - and I couldn't have wished for a better opening. He was great guy and a gentleman, we kept in touch - via facebook - and I was very sad when the magic world lost Steve to colon cancer recently; he is sadly missed. Michael Vincent - seen recently on Penn & Teller: Fool us - one of the worlds great card experts, amazed us with his incredible finger flinging dexterity. He truly is a master of his craft and a gentleman. Fay Presto was superb as she performed her session exactly as it would be in the real world: at a table set for ten guests and ready for her to perform her close-up miracles on the specially invited lay audience.. It was a great night and a fitting event and lecture for 'The Goodliffe Memorial Night'. Wayne Dobson, despite his debilitating illness, - MS - was in sparkling form and keep us all thoroughly entertained with his brilliant comedy magic. I know he fooled a lot of us, including me. It was great to meet Wayne and his lovely wife, Marianne, and I really appreciate the time and trouble they both took to make this lecture happen for me. John Archer, the man who 'fooled Penn and Teller', came along and presented a great lecture on the art of comedy, and if you've ever seen John you'll know there's no one better qualified to do it. The late, great Ali Bongo is one of the most talented and creative magicians around. He was magical adviser on both Paul Daniels and David Nixon's Magic shows, and apparently the inspiration behind the smash hit BBC series, Jonathan Creek. So, you can see why I wanted this legend of a man to be include in my year... but would he do it?When I spoke to him about coming along I was surprised at how eager he was; he agreed immediately. And, it's a foregone conclusion that when you book Ali Bongo you get a great night - he did us proud. Ali may now be gone but he will never be forgotten. Also in that year I managed to persuade Peter Nardi, the man behind The Alakazam Magic Company, to give a lecture / dealer dem. Back then Alakazam was a small concern, compared to the international magic supplier it has since become, and Peter didn't really want to do the gig - "I don't do Lectures" he told me. But somehow, I persuaded him and on the 14th May 2002, he supplied us with a superb night of entertainment - one of the best and well received dealer demonstrations the BMS has ever had..
Andy & Deb with David & Ruth Berglas. The highlight of the presidential year is the Annual Dinner and Dance and it is also one of the biggest magical dinners in the country. I was lucky enough to have David Berglas, who was presenting his award, and who was the then president of The Magic Circle, sitting to my right and on my left was the worthy recipient of his award, Geoffrey Durham - aka - The Great Suprendo, who was at that time a regular face in Dictionary Corner on Channel 4's Countdown. Both David and Geoffrey were very approachable guys and we talked a lot during the meal. Even though everything was running smoothly, I have to admit to being racked with nerves; I still had my presidential speech to deliver, and it wasn't until after this that I had my first alcoholic drink of the evening - I certainly needed one by then. Andy, Deb and Geoffrey Durham. The Cabaret, that followed the meal, was superb and featured Guy Barrett performing his amazing illusions show, Loki with his wonderful silent manipulation act, and comedy juggler Michael Preace had us all in fits of laughter; I'll never know how anyone can juggle and tell jokes like he does - Incredible. The evening, and the year, in fact, went without a hitch but I have to say that I couldn't of done without the help and support of the Society's council and members including Mike Gancia, Liz Warlock, Derek Robins and, Mr and Mrs BMS themselves, (As they are affectionately known) John Jeremy and Pam Buckley. It was, as I have said, a fantastic experience and a year the like of which I don't expect I will see again... unless, of course, they decide to ask me to be President for a second term - well, it could happen - who knows? Below is one of the many newspaper articles that were written at the time, this particular one was taken from the Express and Star. The Middle of June was an exciting time for me. I'd entered the Worcester Literary Festival's Flash Fiction Competition with my short story entitled 'Contract to Retire'. With over a hundred entries I knew the competition was going to be tough and I was unsure as to whether I should actually enter at all. But, after much debate, I finally emailed my 280-word-piece... and waited. On the 15th June 2012 I received an email notification with some great news - I'd been selected as one of the ten finalists in the competition. Wow! I couldn't believe it - what a great success this was for me and my story. But this now mean't that my story, along with the other 9 finalists, would have to be read out at the official Flash Fiction Competition's Finalists Event. Unfortunately, I was, as usual, working - performing magic at a children's party - and I knew I wouldn't be able to read the story in person. Lisa Ventura, one of the Worcester Literary Festivals chef organisers, kindly offered to read my piece - and big thanks go to Lisa doing what I know was a splendid job. On the evening of the event, all ten stories were read out by their authors and then the judges, Callum Kerr and Lindsay Stanberry-Flynn, announced the top three - sadly my little tale of a 'Hit-man with Alzheimers' didn't make it into any of those prestigious spots, but I was, and still am, thrilled and delighted to have made the finals - top 10 out of 100 is good going in anyone's book. And, I can tell you that after reading all the top ten stories the standard was tremendously high, and big congratulations go to the eventual winner Amy Rainbow - what a great name that is for an author. Even though I missed the readings and results I did manage to get there for the final 40 minutes and received a nice welcome when I arrived. Judge, Callum Kerr, was just finishing off reading some of his flash fiction and this was followed by the winner who read her excellent piece. I wasn't expecting to get a chance to read my story, and it was a nice surprise when Lindsay Stanberry-Flynn asked me if I would like to. I, of course, did. The morale of the story (sorry about the pun) is that you'll never know how good you can do in anything unless you have a go. I'm really glad that in the end I did enter. My story along with all the other ten finalists will be available as part of an e-anthology in the near future - I'll let you know when as soon as I know. Below is my entry, I hope you enjoy it. I may have been to this place before, I'm not sure. I couldn't tell you the name of the hotel I'm staying in or the room number—at least, not without looking at the note pad I now rely upon so heavily. I do, however, remember why I’m here and the job I'm supposed to be doing, but it seems that Alzheimer’s is intent on causing me problems. Before it came along, I used to be a very organised person and, believe me, in my line of work, you need to be: nothing can be left to chance; everything has to be planned meticulously, and the slightest mistake can endanger your life. So you can imagine how this affliction is affecting what I do. I genuinely love my work; who wouldn't love a job that allows you to travel the world, pays incredibly well, and provides such a great adrenaline rush? I've been at the top my game for over thirty years, I've got a 100% record—and I'd like it to stay that way. I suppose I'm a pretty tough sort of guy; I've never let anything beat me before—but Alzheimer’s is a battle I know I can't win. So, as much it pains me, in my heart I realise that it'll be safest all-round if I retire. And I will retire as soon as I know that this job is complete. Have I killed him yet? I hope you enjoyed the story, let me know your thoughts via the comments box. And if your interested, next years Worcester Literary Festival is already in the planning stages - 14th - 23rd June 2013, and there are lots of fund-raising events that you can join in with. To find out more information follow this link - WLF. Some other blog posts in my be interested in. 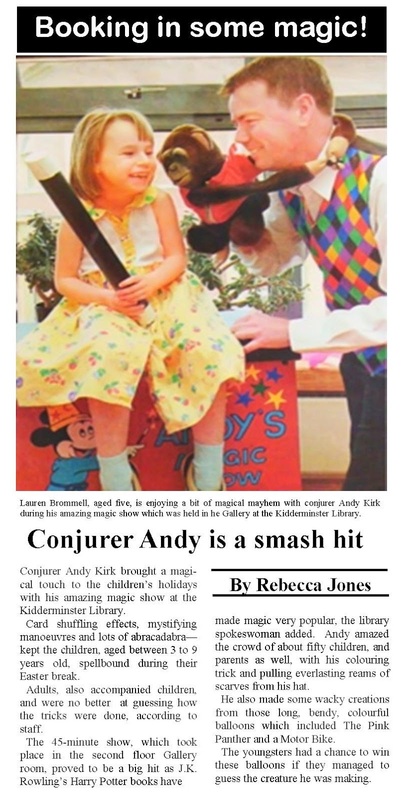 This week I thought I'd share this rather nice review of one of my shows at the Kidderminster Library, way back in April 2004. I've performed many shows at the most of the libraries in the area, and still do to this day. And I always look forward to performing in these venues as they always seem to bring in a really responsive audience. This particular article (below) actually made the front page of the Express and Star - now that's magic. Hope you enjoy reading it. And if you like being being caught out and really badly fooled then why not book one of the best magical bafflers around. 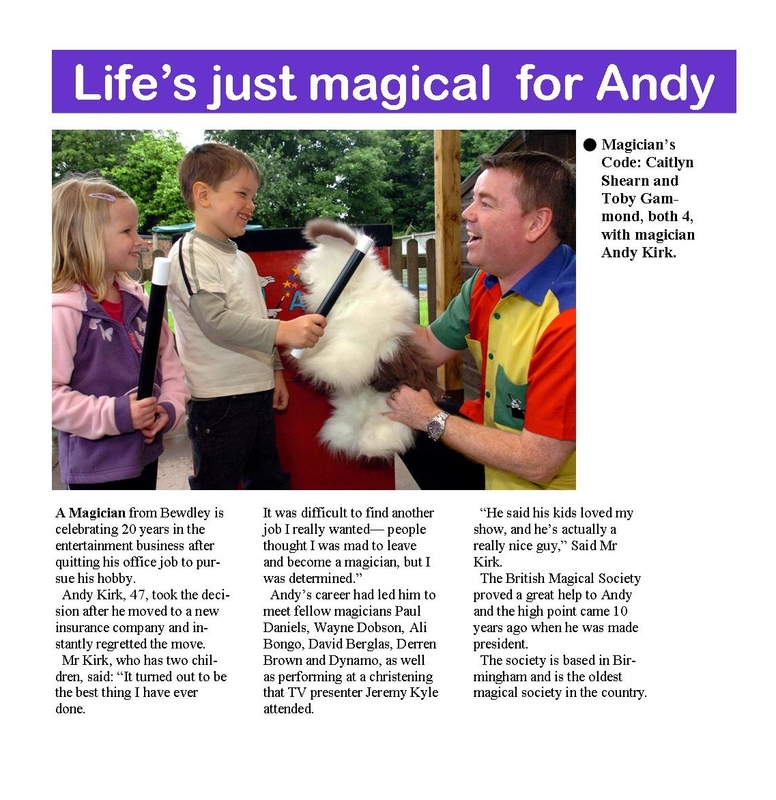 Add a touch of magic to your party or event book Andy Kirk - Close-up and Wedding Magician - go here for more details. This year, 2012, is a special year, not just because the Queen celebrates sixty years on the throne or because it's the year the Olympics are held in Great Britain, and not even because the Mayans have predicted the worlds end. The reason is simply because there will be the astronomical rarity of a Blue Moon. So, what is a Blue Moon? 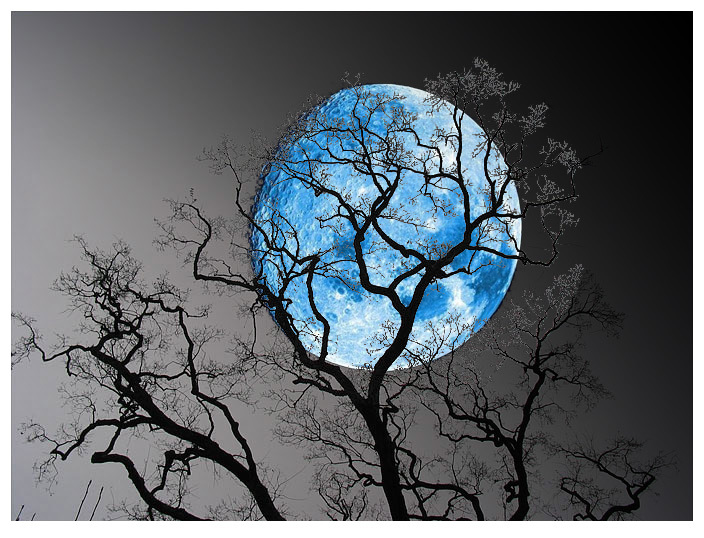 The term 'Blue Moon' refers to the rarity of the occurrence and not the colour that the moon actually becomes, although there have been occasions when the moon has appeared to have a blue hue. This year will see thirteen full moons as opposed to the normal twelve, which means that one month will see two full moons appear. That month will be August. The first full moon has already occurred - 2nd August. The second full moon will be seen tomorrow night - 31st August and when this second glowing sphere appears it will be labelled, by most, as a 'Blue Moon'. The full moon is only seen every 29.5 days, which is the time it takes to ciircle the Earth. 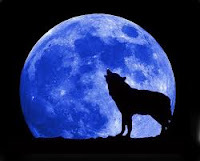 The Blue Moon is used colloquially as a term to mean - 'a rare event', hence the old saying - 'Once in a blue moon'. A full moon is when we see the full sun-lit face of the Earth's natural satellite. The next blue moon won't occur until July, 2013. The moon can appear to be tinted blue and this effect is caused by dust and smoke particles in the atmosphere, and this did occur during the great forest fires in Sweden and Canada in 1950 and 1951. But the most famous instance of the moon turning blue was way back in 1883 with the eruption of Indonesian volcano called Krakatoa. So much volcanic dust was spewed out in to the atmosphere that it created the most amazing golden-red sunsets that could apparently be seen as far away as the British Isles, and the moon shone a bluish-green for many years after the eruption. In 1999 there were two blue moon occurrences- better known as 'double full moon years' -one in January and again in March. There were actually no full moons in February of that year. The next double-full-moon-year will be in 2018. And finally, those shape shifting human beings - better known as werewolves, if you believe in such things - transform into evil quadruped creatures when the moon is full and then begins a night long rampage. It is believed that these snarling, ravenous carnivores have no mercy. They will only cause chaos as they fulfil there own desires by hunting, killing, feeding and mating. So, there you have it, tomorrow night - 31st August - there will be a full and blue moon, and by all means take a trip to a quiet spot out in the countryside where there is less light pollution making for a far better view of this astronomical phenomena, but let me remind you that there are strange beasts lurking out there during the twilight hours on nights like these... you may well laugh, but remember you have been warned. There are two ways to walk through glass. 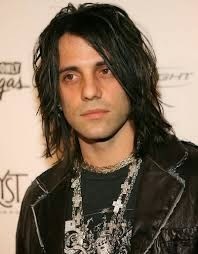 First there's the way magician, Criss Angel - Mind-Freak - does it... with magic. And then there's the painful way this guy, who really should have gone to Specsavers, does it! Well, as a magician myself I'd obviously opt for the Criss Angel version but at least that other guy seemed to be having a smashing time. I know I could never do this Hat-Trick.... Could you? But I've got lots of other tricks up my sleeve... go here to see how to book Andy Kirk - Magician and Entertainer. I can't Believe it! Twenty-Years have passed so quickly - but I can truly say it really has been a magical experience. When I first made the decision to leave my secure job in the insurance industry and plunged into the uncertain world of self employment I have to admit to being a bit unsure as to whether the whole thing would work-out. But I was determined to give it my best try. In the end, it turned out to be the best decision I have ever made. It was, as expected with any new business, a slow start, but once word got around that I was actually alright at this entertainment lark the bookings started to roll in - and I'm happy to say I've never looked back. Over the years, I've performed at all sorts of events from birthday parties to trade shows; fêtes and fun-days, schools, playgroups, shopping centres, Christmas parties, weddings and christenings. And the venues I've worked at have varied just as much too: hotels, restaurants, football grounds, amusement parks, Fire and Police stations, theatres, boats, trains and buses. Every event is different and they are always fun. Sometimes I can't believe I get paid to do this job I love so much. I've been lucky enough to have meet many of my heroes of magic along the way including: Paul Daniels, Wayne Dobson, Geoffrey Durham (The Great Suprendo), Ali Bongo, Derren Brown and Dynamo. Some years ago, I had the great pleasure of appearing on a children's TV series called 'Little Antics' which was shown on Channel 5, and later on Sky Living - it was great fun. 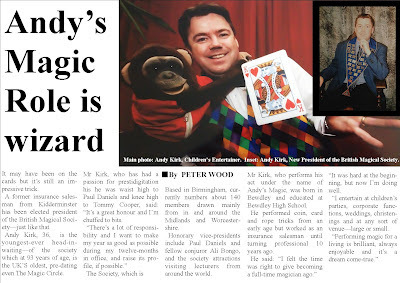 I was proud to be featured on BBC Midlands Today News when I became one of the youngest ever presidents of the British Magical Society, and I've been interviewed several times on BBC Hereford and Worcester Radio. Recently, I was filmed performing my close-up magic at a wedding that will be featured in Sky Livings hit series 'Four Weddings' - details of the air date will appear here as soon as I know. Other highlights of my career include: meeting and entertaining Jeremy Kyle and his children at a christening, and on another occasion it Seb Coe and his family at an event for an opening of one of his sports centres. Johnny Briggs - Mike Baldwin, Coronation Street - was the top draw at an event a few years ago - and what a nice guy he turned out to be. And at a big charity event, Don McLean, comedian and star of Crackerjack, was top of the bill with his stand up comedy - hilarious. I was entertaining with my walk-around magic. I've even worked with Bob the Builder, too... what an amazing life I live. I've had a great time over the last twenty years and I'm looking forward to next twenty and to celebrate this milestone I thought that over the next few weeks I would put some stories of interest - successes and failures; newspaper articles, unseen photo's, that will make you laugh and me cringe, and interesting bits of trivia that you might not know. Plus the true and very sad story of the murder of one of my customers just hours after I'd perform at her daughter'sbirthday. I look forward to sharing these memories with you and I hope you enjoy them all. To kick off, we'll start with the most recent newspaper article that featured in 'The Shuttle' - our local paper. The Photo used (below) was taken at Deerhurst Nursery in Kidderminster, who are one of my longest standing customers; over seventeen years and counting. Queen Elizabeth Through the Years (Morph Sequence). Now this really is magical, and a fitting tribute to her Majesty, Queen Elizabeth, in her sixtieth glorious year on the throne... Marvellous! 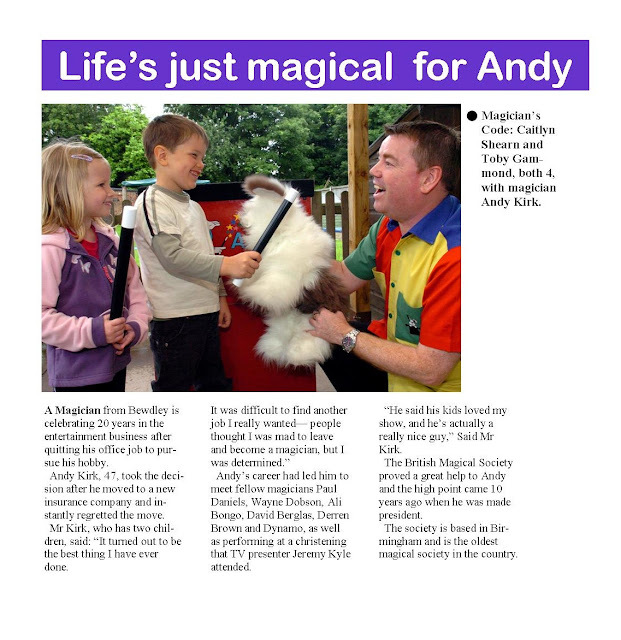 For more amazement why not take a look at what Andy Kirk - Magician has too offer for Weddings, Banquets, Corporate Functions, Trade Stands, Christmas and Bithday Parties and more - here. For Comedy magic that will have in fits of laughter and then leave you gasping with amazement call Andy Kirk - Magician.